YouCalc Dashboards or sometimes also called “Dashboard 2.0” are visual reports in SuccessFactors. Some of these reports are pre-delivered, while others are developed by partners. These visual reports have a pretty nice design and can be used as a Tile on the “Home” Page or as a Dashboard under the “Analytics” Tab. If you need more information about YouCalc read this article first, please. 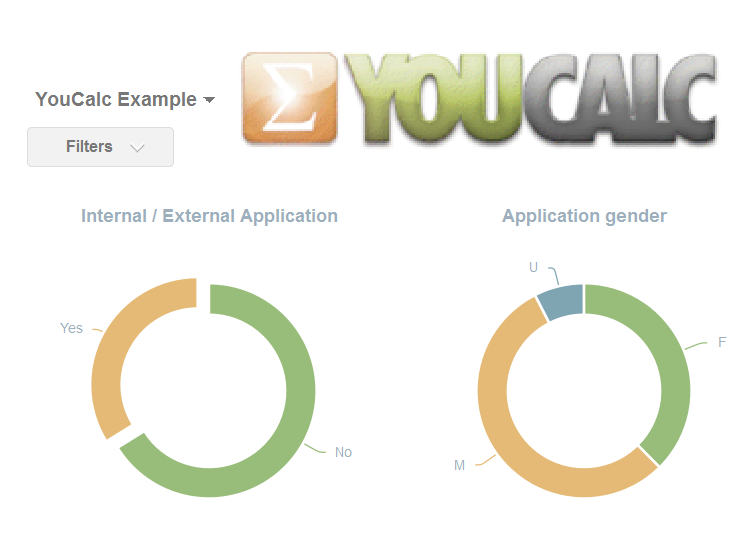 Important Note: The YouCalc Dashboard Builder is only available to SAP Partners and SuccessFactors! Customers can either use the limited online Tile & Dashboard Tool or work with a SAP Partner to build YouCalc Dashboards. 1. Preview helps sometimes to see the data. Let’s say you imported a Report Definition and build some functions around it; some days later you open your YouCalc File again and it is empty. Well, you still have the functions, but without any data. Whatever might be wrong in your file, my first tip is to check the “Connection Setup” (a small tool Icon on the top right in the Project Explorer area) and see if you are in the right folder, where you stored your Report Definition and CSV. If this is fine, just try to preview the Dashboard. Sometimes magic happens and you see your Data afterwards. Worst case scenario, you have to insert the Report Definition again. 2. Click to the Function you want to add to. Everyone who’s worked with YouCalc before knows that sometimes adding Function and Elements in the Function area goes very smoothly, but sometimes it feels super painful! Normally the Builder will walk through with you and add “point” for “point” everything you want to add. Sometimes you may accidentally click somewhere else or want to add something somewhere else. To save time linking everything again just click at the function you want to add an Element to, and it will continue going from there (no, you don’t need to select the “add point”, just the function works fine)… A picture may help – do you see the difference? Adding some stuff to an existing function can cause problems. Sometimes it isn’t working at all and the functions is freezing up, so you just can click on the red X (discard all changes). Sometimes it seems to work, but you don’t get a result. If you access the Function again, there may be some parts missing! Sometimes it just works fine… so whatever you want to do, Save before! Try to avoid more than 3 or 4 different functions levels or having too much complex stuff in one object overall. 4. Save and Reload Versions. JUST DO IT! As simply as it sounds I just want to avoid you doing half or a full day of work and realising afterwards that nothing you did is working anymore! In some of the cases there is still hope and you can find an error in the file. Some of the experts can even edit the epix files to fix things, but sometimes things go wrong. My best practise is as follows: I create a new Dashboard and save a first version after importing the Report Definition and testing the CSV File. After building 2 – 5 Objects, I save a new version (probably every 15 – 30 min). If I am sitting on a complex one I save a new version afterwards. I never lose a lot of time if I have to reload. I always have around 15 – 25 Versions of a Dashboard. You want more Tips and Tricks? Add your Tip in the Comment Section! Stay tuned for the Expert Version of Tips and Tricks for the YouCalc Dashboard Builder. You still don’t have enough and want to learn more? We offer various SuccessFactor Reporting Trainings. If you have bespoke training needs, the packages can be adjusted accordingly. Just ask – we are happy to help. The same applies for a SuccessFactors Demo. According to your requirements, we can prepare a SF Demo to show how things work and what options you can have. Just want to note for any SuccessFactors customers reading this post, that this is an internal tool that is not available to Customers. The online version that is available to customers is the Tile & Dashboard Builder in Admin Tools & the Report Center.